For the most part, the story works. Docter's vision of the inner workings of a child's mind is engaging, colorful, and informative, and, as with most Pixar films, tries to convey a valuable life lesson to viewers, not just putting color and fanciful stuff on screen to just look pretty. It's another year, and it's time for another Disney/Pixar movie. This year's is entitled Inside Out, and is directed by Pixar veteran Pete Docter (Monsters, Inc., Up). Inside Out tells the story of a little girl named Riley and her inner feelings, Joy, Fear, Anger, Disgust and Sadness. Through the film's opening sequence we witness the birth of Riley, as well as her inner feelings in her head. All-in-all Riley is a pretty happy child and these basic feelings keep her running well internally. However, once Riley's family has to move to San Francisco, her world is sent into turmoil, along with her emotions, and as sadness takes over, Joy tries to make everything happy again but only manages to get them lost in the deep recesses of Riley's mind. With the clock ticking, and only Fear, Anger, Disgust running things at "headquarters" Joy and Sadness must race against time, and the inner workings of Riley's mind, to try to set her back on the right track. While most Pixar films created are treated as children by their respective directors, Inside Out was given extra special care by director Pete Docter, as his daughter was the inspiration for the movie. Docter and his team researched every little detail possible to try to make the story of Inside Out come to life as realistic as possible. The team consulted with psychologists and other experts to make sure their take on short-term and long-term memory made scientific sense, as well as how memories were discarded. Some of the dialog is a bit dry, but the actors, Amy Poehler (Parks and Recreation) as Joy, Phyllis Smith (The Office) as Sadness, Bill Haden (Saturday Night Live) as Fear, Lewis Black (Unaccompanied Minors) as Anger and Mindy Kaling (The Mindy Project) as Disgust, do the best they can with the material. Poehler's character of Joy does get a bit annoying at times (think of her as a horrible imitation of Dory from Finding Nemo). However, Smith's Sadness character, as well as the "brain workers", give some much needed comedic relief to Joy's character traits. Inside Out looks amazing on Blu-ray. The 1080p AVC-encoded transfer shines through crystal clear. Colors are bright and vibrant, and there are no signs of artifacting. The 3D Blu-ray looks as stunning and as clear as the 2D counterpart. None of the colors appear dull, and there is a strong perception of depth added to the film. The DTS-HD Master Audio 7.1 soundtrack played through the film also adds quite a bit of audio depth to the presentation, allowing you to feel like you are also inside Riley's head with Joy, Fear, Anger, Disgust and Sadness. As usual with Disney's Ultimate Collector's Edition releases, this Blu-ray is filled with extras in it's four disc collection. Aside from the 3D, 2D, DVD, and Digital HD versions of the film, Inside Out contains the Pixar short, Lava, which was shown before the theatrical release of the film; Riley's First Date short which again shows the inner workings of the family's minds at this new milestone in Riley's life; Paths to Pixar: The Women of Inside Out which contains interviews with the female cast and crew of the film; Mixed Emotions looks into the research into emotions to properly portray them in the film; A six-part Behind the Scenes featurette in the making of the film; Four deleted scenes; Inside Out promo trailers. With nothing really outstanding, Inside Out is another by-the-numbers Pixar release. It has heart and soul and ultimately teaches a valuable lesson about life, but there is nothing memorable that that won't make you forget about it by the time the next Disney/Pixar release comes along. 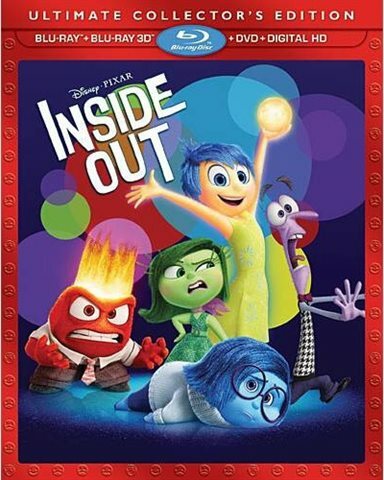 However, if you are a huge fan of the film, this Ultimate Collector's Edition release is the perfect way for you to get more out of your Inside Out viewing experience. Download Inside Out from the iTunes Store in Digial HD. For more information about Inside Out visit the FlickDirect Movie Database.